My SFAM Gail, of Aging with Grace and Strong Will has given me this award. As Gail described in her nomination, we have a great deal in common; even more than meets the eye! We lovingly call each other SFAM, as we feel that we are like "sisters from another mother.' ;-) Gail is such a supportive friend and an amazing mom to her two beautiful children from China, Grace and Will as well as her adult son. She and I have only scratched the surface on what it is to start all over again at this point in our lives, though I think that we both agree that the wisdom that comes with the our years trumps youthful energy any time.....well maybe most of the time! When Gail and I are not communicating via our blog or e-mail then there is always facebook to keep us updated on each other's adventures. Thank you SFAM for the honor of your nomination. 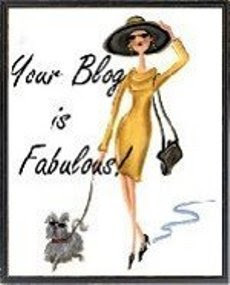 Pass it on to 5 fabulous blogs, including the one that gave it to you and link them. 1. Viv of Life with Kerri writes a fabulous blog and is a dear friend to boot. She is a transplanted Canadian who used to live here in South Florida. I love her blog and her daily tales of Life with Kerri almost as much as I love her and her family. Check out this amazing full time mom and wife's blog who knows how to cherish the moment. 2.Mary of Ladybugs and Dragonflies is another dear friend of mine and "blogger of late." Even though Mary is new to the Blogisphere she has been around the block a few times. Actually four to be exact with her two wonderful homegrown children, Lindsay and Chris and her two precious daughters from China, Olivia aka "Livi" and Sophie. This full time mama is usually in her minivan running someone to somewhere, so I am not sure how she fits blogging in but I am sure glad she does as I love her ability to tell it like it is. 3. Colleen of Welcome to the Nuthouse is mom to six; her four grown up sons and her two adopted beauties, Olivia from Korea and Addison from China. Colleen and I waited for her Addison and my Katie Starr at the same time and have found support in each other for a long time. She has been the cheerleader for our DTC family in addition to her own and her devotion to all that she loves knows no bounds. Check out the antics in her "nuthouse" and you will know why this lovely woman can't keep the laughter out of her blog voice. 4. Tammie of On Being Erin's Mother is another wonderful friend of mine and the voice of honesty. She never holds back in her blog nor does she hold back with her love and care towards her friends. There has been no one in my life that has reached out to me in support and care as much as Tammie and most recently with the illness of my FIL she has been the daily voice of love, concern and prayers. My only complaint with Tammie lately is that she is not blogging as frequently as I would like her to. I need my Erin fix. Tammie's amazing little girl is as devoted to my Ethan as he is to her. They share a red thread that weaves us all together. 5. Last but not least is Barb at Journey of Love. Barb is the reason that Marc and I adopted from China. She is Marc's ex-wife but there is nothing ex about her. 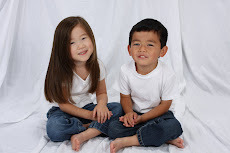 She is a friend to him and to me and now we will always have the connection of our children from China. It is a long story as to how and why we adopted because of her but suffice it to say that we are very grateful to her. We will always hold her in a special place in our hearts. Her daughter Mia is the perfect fit for her and her hubby Mike and she is as special as they are. Check out the their blog and you will see a family that is living the credo that love is the journey and not the destination. Part of this award asked to list my five fabulous addictions. I am going to pass on that one as life has been so hectic for a couple of different "NOT FUN" reasons lately and I have virtually no time (or money) to pursue the things that I would love to be addicted to like traveling or shopping or dining out like I used to be able to. Blogging is of course a huge passion of mine and my guilty pleasure of facebook is an awesome way to keep up with the family and friends easily in a fun way. I know I promised photos of last weekend and I promise that I will ASAP. Marc is taking me to dinner and to see the "Dancing with the Stars" show tomorrow evening. He gave me the tix for Hanukkah and Justin is coming by to take care of his little sis and bro. This weekend I will do my best to catch up a bit! Lori Oh my goodness I feel so honored!!!! Thank you so much!!!!! I will write up a post and link it back to you. Thank you dear friend. I'm sorry about your hectic life at the moment...I hope it passes soon. Lori, you are an amazing person. I count myself honored to have you & your family in my life. Thank you so much for the award! Life has been migrainey since we got home, but I promise to blog this weekend about CNY, life with Erin & everything else! I hope things ease up a bit, sending positive thoughts your way! YOu are having grown up time?